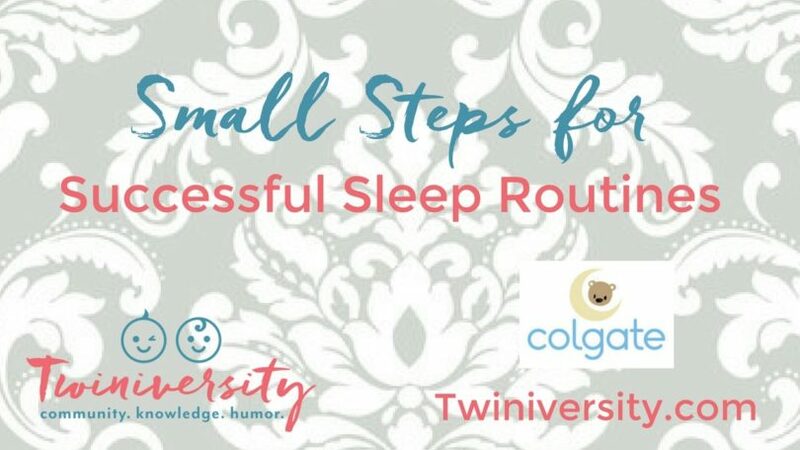 Nat hosted a Facebook live on the topic of Small Steps for Successful Sleep Routines, thanks to our friends at Colgate Mattress. Check out the video below for all her great tips and tricks to get your twinnies on a great sleep routine to get more sleep for your whole family. Hey gang, it is Natalie Diaz. Welcome to a live edition of “Live With Nat” as opposed to those taped editions of live with Nat? I’m not really sure. Anyway, today we are going to talk all about sleep. So – basically how to create a good sleep routine for your kids. What exactly is a sleep routine and so on and so forth. We are going to answer a bunch of your sleep questions. Just to kind of give you the lay of the land – I am here live in New York City at our Twiniversity Studio. Julie is on with us, she is over in Chicago as the “wizard” as we call her. She is going to be fielding all of the questions that you have. So, if you see me look over here, it’s simply because I have a little computer next to me and then the questions pop up. Hey, Diane is here! Everybody is starting to arrive. So, we have got East Coast, West Coast represented. And Laura is here too. I’m so glad everybody is here… and Carrie. If Kimmie and Lauren show up we will have the entire Mom Squad which is great. We are going to be going live for the next hour answering all of your sleep questions. Today we are very excited to have partnered with our friends at Colgate. If you do not know, I love me some Colgate. How many of you guys, show applause or thumbs up or whatever you want to do, how many of you guys have your twins sleeping on a Colgate mattress? Wow! We have people from all over the place. This is great! So, How many of you guys are sleeping on a Colgate mattress? If you are I want to see some thumbs up, I want to see some hearts. These are how we interact so I don’t feel like I am talking to myself. Which is funny…because I NEVER feel like I am talking to myself when I am live with you guys. Kimmie IS here! I told you we would have the whole squad. Before we go any further, I want to say Happy Mother’s Day. Happy belated Mother’s Day to all of you out there. I would love to know how you celebrated your Mother’s Day. I am hoping that is was pretty extraordinary. Let us know! Oh, Colgate is here too…good! Yes good. So if I have any of those tough questions, our friends from Colgate are on with us as well. So, how did you guys celebrate your Mother’s Day? What did you do? Did the twinnies get you anything? I would love to know. Today, as I said, we are partnering with Colgate who is on with us as well. We are on Mother’s Day. That is what we are talking about so far. We are getting some questions, yay! I love my questions. First I want to tell you once again…I want to give a big thanks to my friends at Colgate Mattress. Colgate is one of my absolute favorite companies. They started in 1955 down in “Hotlanta” and they are still a family owned and operated company. They have won so many awards for health and safety that it is just mind-blowing. What I love most of all about Colgate is, first of all, I believe I slept on a Colgate mattress. I discovered this after talking to my mom. Colgate mattresses are like the gold standard in the mattress world. I do want to let you know that Julie and I have just returned from the JPMA Baby Show over in Anaheim California. I want to thank all of our West Coast families who joined us. I mean there were a lot of West Coast families which was really, really nice. It was just so great to meet you guys. So, thank you so much for coming out. We gave a little presentation with Meg from Lucie’s List. If you don’t know who Lucie’s List is, you should definitely check them out. And then Ali from weeSpring, so I was lucky that we had a standing room only. Literally, there were people sitting on the floor. We were discussing mistakes that new parents make. So, we had our wonderful baby show over in Anaheim. We got to see our friends over at Colgate. And be still my beating heart, Alan from Colgate is one of my favorite people in the entire industry. Any opportunity that I get to play with their company … it just literally makes my heart sing! I don’t know if you could hear it, but my heart is literally singing! I want to sing a little lullaby. Now of course I am singing lullabies and things that you could sing to your twinnies. So, let’s get right in and talk about some questions. Then we’ll talk a little more about Colgate. You know that they gave us some prizes to give away. Of course, we have some prizes to give away too! I love it, I love it, I love prize time! In order to see the questions, I need to put on my goggles. Alan is the best, Dennis is good too, I don’t want to go crazy Colgate…I am definitely a fan. Alan is still just … I don’t know, there is something unbelievably classy about that family. So you know that the products that they make are just top notch. Because they – themselves – are top notch. When they are making baby mattresses and their changing pads and everything else, there is so much love that goes into their products. I really can’t say that for many companies in the industry. You guys know, Colgate knows, they are on with us too. It is so obvious. Thank you so much. I actually think that that is pretty good. If they are taking a 3 hour nap at home and an hour and a half nap at daycare, so that is 14 and ½ hours, I think that we are pretty much on track. Are you concerned? Diana I have another question back for you. Why are you concerned that they are not getting enough sleep? Are they super grouchy during the day? What are your suspicions? But, what you could do is check next time you go to the pediatrician. I could say that at this age they are supposed to sleep this much, in this stage they are supposed to sleep this much. Typically because I don’t know how old your kids are, well you told me how old, but not how early they were. It depends. And truthfully some kids need less sleep than others. What is interesting is that even with twins, one twin may need less sleep. I know with my kids I have an early riser and I have a night owl. So I have two totally different little animals. When they were very, very young I would put them in…and I started to see that this was happening…but I forced them into having the same sleep schedule. It took me quite some time to see that that really wasn’t good because they just had different sleep rhythms. I want to say to Diana that I think they are getting enough sleep. If you don’t think that they are getting enough sleep then maybe make their bedtime a little bit earlier. You didn’t tell me what their bedtime was, but I am going to assume that it is around 7 o’clock because typically kids will sleep from 7 to 7. Ok, Melanie has our next question. Melanie, here is what you can do. So, you are putting them in and now you are trying the sleep method. I’m just curious to know if the other baby was sleeping or if it’s just the one that is not sleeping. Alright, the stupid diaper is right! Number one, what I am going to say about the stupid diaper is “What diaper are you using”? You should consider moving to Pampers Baby Dry. Pampers Baby Dry gives you 12 hours of protection. What I thought was really fascinating is that we were talking to some cloth diapering folks over the week, and I had no idea …and get ready to have your mind blown… there were so many people who use a conventional diaper. Then what they do for the nighttime is they take a cloth diaper and they put it over the diaper so there are no leaks. I do not believe that you will need to put anything over and this is really just a parent hack. This is not anything that anybody is recommending other than my own little Twiniversity parent hacks. That is something that you could do. The Pampers Baby Dry is 12 hour leak protection so you should be okay with that at night and I am hoping that you are able to try those out. So, you have only one kid that is not sleeping. You are starting the training method. Now, Melanie, the other little tiny boy is able to sleep through the night? I want to know if the other baby is waking up at all and what time are you putting them down. I am just going to say typically when you are starting a sleep routine. And let’s talk in a very general way about starting a sleep routine. There are some things we have to do before we even consider starting sleep routine. -We need a dark room. When I say a dark I mean like blackout shades on the windows kind of dark. Home Depot sells these kits you could use to cover your window. You could literally just buy some blinds. Whatever you are buying make sure they are already baby proofed so you do not have to do that somewhere down the line. -The temperature of the room needs to be between 68 and 72 degrees. So, kind of on the nippier side. You certainly do not want warm in the baby’s room whatsoever. -You need some kind of white noise. White noise could be an air conditioner, white noise could be a humidifier, white noise could be a literal white noise machine. Those are kind of the top three. -The next thing you definitely need is you should consider swaddling. Even at five months you may want to swaddle. We love the Love to Dream Swaddle UP, take a look at those. If you are not swaddling already it may be too hard to introduce. But, it’s certainly worth a try. So… dark room, white noise, cool temperature, swaddle. Boom! Now we have set the stage for sleep. I believe that you should start sleep training in the day. Now, if you guys don’t know, I am very good friends with Kim West who was contemplating joining us today and I would have been super excited, but she is over in Amsterdam for a conference over there. Kim West and I have gone several places and done sleep lectures. Kim West is the literal sleep lady. She wrote the book on sleep training and more of a gentle method. Not saying that she won’t try the cry it out method, but in general she definitely is a little bit easier. Kim is the originator of what is called the Sleep Lady Shuffle. It works for older children, but it may be something that you want to start. What I recommend that you do is – Kim says – you basically go into the room and you set yourself down in the room and you wait for them to fall asleep. Once they fall asleep you kind of shuffle yourself out of the room. If they make noise while you are there, start to cry, you just say babies I’m right here. But you are sitting down, you’re not attending to them, you’re not picking them up, you’re not doing anything. You are basically just letting them see that you are in their little safe space. They are getting used to everything that is around them. That is Kim West’s method, the Sleep Lady Shuffle. Now, there are other methods right? There is Weissbluth and there is Ferber, and there are lots of other methods in between. So, what some people do is gradual extinction. I believe this is what Melanie was trying to say. She puts the babies in. You put them in drowsy, but awake. You put them in their bed, you are like, “Babies, I love you so much”, then you drop the mic and you leave the room. When you leave the room, you shut the door because we want it to be dark even if it is during the day. Once it is dark, then what we do is wait 5 minutes. We are not going to go in in 5 minutes, but if they start crying we are going to give them 5 minutes. Then we go into the room and we are like “Babies, everything is okay, there is nothing to be upset about”. We are going to verbally comfort them. Maybe shush, shush, shush them a little bit. You are not going to touch them because we are trying, not to be the worst parents ever, we are trying to teach them that they have to soothe themselves. We are not teaching them how to sleep. Every baby knows how to sleep. We are teaching them, basically letting them know, “Hey kids, you have the skills to put yourself to sleep”. I just have to kind of teach you that. Alright, we go in after five minutes, calm the babies down. Everything’s good, we leave the room and shut the door. Once we shut the door maybe we have some peace. Maybe we have some chaos again and everybody starts crying. If that’s the case…now instead of waiting 5 minutes…we are going to wait ten minutes. Then in ten minutes we are going to go in, shush the babies, say “I love you babies, I don’t know why you’re freaking out, everything is okay, nothing to worry about”. Then we are going to leave the room. Maybe they’ll calm down, maybe they won’t calm down. Now instead of ten minutes, we are going to wait fifteen minutes. You keep extending the amount of time between the times that you go in. Now look, Rachel, I know you are asking about newborns. Don’t even worry about newborn sleep right now. Focus on feeding schedules in the beginning. Slip this in once they are between four and six months. But – you must speak to your pediatrician first before you start any sleep routines okay. Now, once you wait your certain amounts of time. You do your five minutes, you do your ten minutes, you do fifteen minutes. Whatever you want to do. Once you get to a point where you can no longer take it, then that is now called gradual extinction. 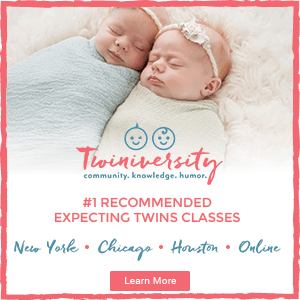 The funny thing we were always talking in Twiniversity classes, which by the way there is an online Twiniversity class tonight, so if you are expecting twins we are going to literally stop everything. We are going to give away a seat in tonight’s online Twiniversity class. Which I will be teaching! You are so lucky! 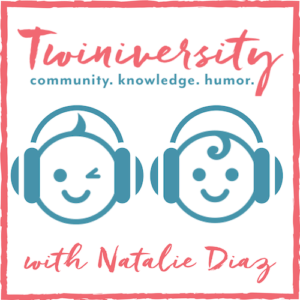 If you would like to join us for an online Twiniversity class, all you have to do is just say “I want to come to class”! It is a pretty full class. We are very limited on seats. I wish I were not kidding and that I had a bazillion to give away. But – we are giving away ONE seat in tonight’s class. Actually it is not going to be just tonight’s class, it is going to be next week’s class too. I like it when everybody sees everything at the same time. If you would like to join us for class, all you have to say is “I want to come to class”! This is perfect if you are expecting. This is perfect if you have tiny little babies. All you have to say is “I want to come to class” and then you will have to opportunity to win. Julie will definitely put that out there for you and tell you exactly what you need to do. Now. Going back to the timing schedule. We talked about the sleep conditions. We talked about the gradual extinction. The next thing that I want to tell you is, how many of actually think that the babies can tell time? We know like 5 minutes, 10 minutes, 15 minutes… But do you think that the babies are in there and the babies are like uhhh is it 5 minutes yet? Wah! Oh, 15 minutes is passed – wah! No, the timing is for you, the timing is not for the babies. The timing is for you to kind of get yourself together and giving them an opportunity to see that they can sleep for themselves. And that alleviated so much stress that I felt. I was okay, they are crying, I can hear them. It was once the crying stopped. I would – not kidding – I would belly crawl into the room and peek above their mattress! So this would be me, I’d like dum, dum, dum…babies are okay, then I would go back to my regular business. And pray that the babies never caught me which was always so stressful. Alright guys, I want to know how old your twinnies are. So, where are you from and how old are your twinnies. Throw them up now. We have so many questions coming in, I want to field the questions. If everyone has 2-year-olds, then I will help you guys in a general sense instead of just one person. So, who are you? Where are from? And also if you are expecting or how old your twinnies are. Let’s go to our next question while you guys are getting all caught up. Okay, so here is the scoop. Sleep regression is a real thing. It is not an urban legend. You are going to get to these peaks and valleys in sleep. They are not going to sleep consistently until they are a little bit older. Because…you not only have sleep regression. You have teething. You have time changes right, we have daylight savings which I swear is like a punishment. You have sickness, we have vacations…there are so many things that interfere with babies sleep routines. Babies sleep routine. Get back to me on why I don’t like saying babies “sleep routine” it’s a little bit weird. Let’s go back to this question. Everyone knows about a dream feed? Well, I don’t know if everyone knows about a dream feed. Who was here yesterday for Chelsea’s live feed? If you don’t know what I am talking about…there is this mom, her name is Chelsea. She has little tiny boys who are absolutely awesome little dudes. We are very lucky to interview her once a month or maybe even more. We will check in on Friday about what’s happening in her babies’ lives. She is like the “every mom”. She is staying with her mom right now. She is on a pretty good eating routine right now. She is so lucky, knock on wood, I’m literally knocking on wood because I am that superstitious. She is not doing a dream feed. So she is like, these babies are getting up at 4 o’clock, 5 o’clock in the morning…why is this happening? I said well, when was their last full bottle? She’s like their last full bottle was at 8 o’clock. Well – if their last full bottle was at 8 o’clock they are starving! Hey, what’s up mom, I’m so hungry! So, I don’t think they really sound like that by the way. But, in my head that’s what they sound like just for funsies! So I told her there is something called a dream feed. What a dream feed is, is you go through your whole day. You have your feeding schedule. So you feed every four hours all day as much as possible. Then you get to 7 o’clock. 7 o’clock is when you start your nighttime routine. When you start your nighttime routine, what happens is you put the babies in. But…the babies can’t go from 7 to 7 yet. They need to be topped off. I was talking to somebody the other day. It’s like when you are planning a long road trip, right before you leave you make sure that your gas tank is full so that you could drive for as long as possible. Basically topping the babies off at the 11 0’clock – midnight feed or whatever is filling up the rest of their tank so they can make it through the entire night. If you are having trouble grasping what I am talking about, that’s a way that I want you to think about it. So, a dream feed is…It doesn’t have any or the nighttime rituals. It is simply that you are going to go in, change a baby, feed a baby, put a baby back. We were looking at questions from Diana and she was talking about wet diapers and stuff. This is the time you want to change the baby one more time before the end of the night. That is what a dream feed is. We have so many questions coming up, this is so exciting, it really is! I’m so thankful that BUT…I think it is time that we give away a prize. If you want to be prize time you have to say “Prize time, prize time”! Our next prize that we are going to give away is an Amazon gift card. This is from us to you as a little Happy Mother’s Day. We are going to pick a lucky, lucky winner. All you have to say is, “I love Amazon”. I really wish that we worked with Amazon because that would be fantastic. I am a huge Amazon buyer, I don’t know if you are too. We would happily send you a little Amazon gift card from the Twiniversity Mom Squad. All you have to say is, “I love Amazon”. You could use it to buy diapers or whatever you like. Before we go to our next prize, let’s go to our next question. “Any advice for nap schedules? Nine month olds here and one naps for 2-3 hours, twice a day. The other will cat nap for 20 minutes to an hour which is my whole day. They both sleep through the night.” Oh my gosh! Megan. You are so lucky. Everyone should say Megan you are so lucky! Because Megan has babies that are sleeping through the night. She has 9-month olds that are taking one nap for 2-3 hours and a cat nap for 20 minutes. Now, I don’t see why you are trying to rock this boat Megan? I would not be rocking this boat. They are sleeping through the night for 11-12 hours and they are taking 2 naps. You are sooooo far ahead of the game! Megan, are you just bragging about how awesome are? I don’t know if you need any advice. If they are sleeping and they are having their naps – what time are their naps? Are you giving them a 9 o’clock nap? Are you giving them a 4 o’clock nap? What is your typical schedule like? I don’t know if anybody has a copy of this little book. I’ve heard it’s a pretty good little book. This is our Twiniversity book, it’s called “What to Do When You’re Having Two”. If you see, chapter 9 is called “Schedule + Sleep = Sanity”. For those of you who are talking about having a schedule. Is there a schedule? I actually give you a whole schedule, can you see that? I break it down into a 12 hour day. I break it down from infancy, so the time that they come home, until they get bigger. If you look right there – boom! I have a whole schedule printed out for you guys which is really fantastic. And it’s free. This schedule is not only based on what the Twiniversity babies did…so Anna and Johnny…what they’ve done. 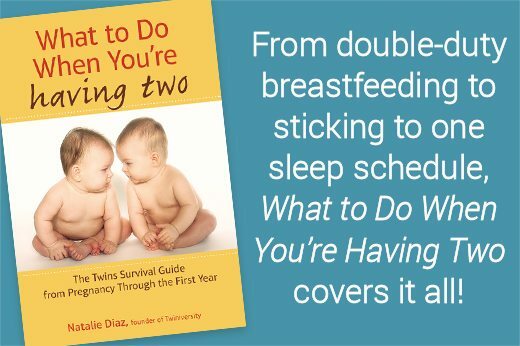 We also talked to many doctors and pediatricians and sleep experts as well, when we were developing this little book called “What to Do When You’re Having Two”. If you don’t have this maybe you could use your Amazon money. I’m just saying. If anybody has friends that are authors, the biggest gift you could do is you could go and review this on Amazon for me! That would make my day. If you like it and even if you didn’t like it honestly I’d rather you go and tell me what you didn’t like about it just so I could modify it again. This book…we have just a little bit coming up yet…but it is getting a fifth anniversary. We sold over 28,000 copies. I’m going to say that my mom has bought about 27,800 copies! That’s just my family, just what we have bought. It’s out there and doing really well. We are going to do some updates so that is very exciting. One other thing that I wanted to talk about is if you don’t have this book hmmmmm…. Guys, do you sense a “prize time”? If you sense a prize time coming on then all you have to do is say “prize time”. I am looking for all of the other stuff that’s in here because it is so great. What I really love about this is we have the mother of all indexes. Truth be told, when I am looking for something in the book I often go to the index. If you would like to win a copy of this book, just say “I want a book”. And know that all Twiniversity students that join us for an online class or an in person class always get a copy of our book. For our online class, in addition to that you also get a package of Pampers. Isn’t that nice? Isn’t that special? Let me just talk about Colgate for one more second. I don’t know if you know, but they make the contour changing pad. This changing pad is made by our friends over at Colgate and basically turns any surface into table. If you are registering and you are like “What am I going to buy? What am I going to use for a changing table?” you definitely want to look at the contour changing pad. I have a sneaking suspicion that one of you might be getting one of those today, so keep that in mind. Danielle, genuinely great question! So – for feedings you wake everybody up. Always feed one baby if you are going to feed the other. However, I don’t know if you caught me at the beginning of this feed. I was talking about how even though you have twins, they might have very different sleep cycles. One may be an early bird, one may be a night owl. It’s really hard to tell. When they are infants, you might get a glimpse of this pattern. Say, okay, baby A likes to sleep late, but baby B likes to go to sleep early, so it really depends. I know that having an early riser is a way to have an opportunity of having ONE kid. Right? Because we are dealing with these twinnies all day long and they are always in a herd of babies. Let’s say we put them both down for a nap. Instead of sleeping 2 hours, one only sleeps an hour and 30 minutes. Do we leave them in there to just cry and whatever? No! You go and liberate my hour and 30 minute baby and try not to wake the 2 hour baby. That way I have a half hour with just one little baby. That is one way to deal with it. I would definitely really not wake that other baby as much as possible. That other baby may need more sleep. But, if you are noticing that the baby who’s sleeping more is having more trouble sleeping or whatever, you may want to consider putting them on the same sleep schedule. But, otherwise it is just a great opportunity to spend time with just one little kid. Anna always required less sleep. My baby A required less sleep than my baby B. Still, to this day, he still sleeps more than her. Like we will be out, watching a movie and having fun and he will be like alright, goodnight everybody. We are like okay, thanks, thanks for joining us for a movie night. He just goes to bed. Now they are old, ancient children at the ripe age of 12. He was always like that. He could go down so easily, I could put him in his crib. He slept from the womb pretty much. It was my baby A that was the one that was like, “Oh my gosh…is this kid ever going to sleep?” She is still that way. She would stay up until 2 o’clock every night, and then every morning when I would wake her up for school she’s tired. That is just the way it goes. So, take advantage and watch their little sleep cues and then you will know what to do. For my new families or expecting families, let’s talk about how we are going to get them on to a sleep routine. When the babies are born, in the hospital, they will start them on a routine – a feeding routine. They will be fed every 3 hours around the clock. At around one month adjusted they are going to move to a 4 hour feeding schedule. Once they are on a 4 hour feeding schedule we are not going to worry about sleep. We are not going to worry about sleep because we have to get on our feeding schedule first. Then, we are going to slip our sleep schedule in. They are going to sleep usually after they have a feed. They are going to take a little cat nap. Maybe in their bouncy seat, maybe in their rock and play, maybe in their crib…wherever you choose. But, the first thing you are going to do is establish your feeding routine. Then, shortly after, maybe 3 months, 4 months, 5 months depending on what you are most comfortable with you will really start seeing the pattern develop. Now it is your turn to nurture that pattern and get them on a sleep routine. Usually they will get up at 7. Hypothetically we are on a 7 to 7 schedule. So, 7 o’clock they have a feed – they go right back in for a nap at 9. They sleep until 11, you wake them up, you give them a feed. You will see that these routines will start to develop. It is all in the book and it is actually all on line too. It’s on Twiniversity. We would never hide anything from you guys. You can get all of our information 24 hours a day. We start this sleep routine. The next thing we have to do…and one of the biggest pitfalls… we have to start practicing this drowsy but awake business. So, what we are going to do is – when we see that they are tired, when we see a big yawn it is almost too late! You have to look for this, the slow blink. It’s funny because I was talking to Dr. Weissbluth once upon a time and he was giving a sleep lecture. He was saying that you’ve got to look for that slow blink and I’m like, “Alright, Dr. Weissbluth, that is really fantastic.” However, for you to catch that slow blink is really, really difficult. If you do you just put them in their crib. Once they start yawning, they are a little over-tired. If you notice that they are yawning a lot and then you put them in and they are having a lot of trouble, just try to put them in a little bit earlier. If 9 o’clock is naptime and they are overtired and they’re giving you too much fuss, put them in at 8:50 okay? Practice putting them in drowsy but awake. If you can get them used to putting themselves to sleep, you will never have to worry about crying it out, gradual extinction, sleep lady shuffle, whatnot. If you can get them used to sleeping on their own you will never have to worry about it. I think that it is prize time. Let’s give away another copy of the book because I keep talking about the book and the schedule. I want to make sure that everybody has them. If you want a book just say “I want to win a book”. It would mean a lot to me. Also, it is not required, but if you could share this with anybody who needs the information and Julie if you could share this over on the national page too, that would be fantastic so we can field in a few more questions. Bath time right before. Bath time is a pretty typical nighttime routine. However, if all hell is breaking out at 4 o’clock and you need to bust out bath time…do what you’ve gotta do to get through the day. A nice bath time routine in a perfect world would look something like this. The babies had some food, right? This is if they are a little bigger, around 6 months. Maybe around 6 o’clock we give them a nice warm bath. Preferably in the sink so that we don’t have to bend over and hurt our back. We give them a nice little bath, then maybe we put them on the changing table. We give them a nice little massage. Maybe some baby lotion, anything that you like. You can even use coconut oil as crazy as that sounds…it’s a great way to give the babies a little bit of a massage. Then, maybe we throw on a little classical baby which is one of my favorite things when the twins were little. We would put on a classical baby, a little music. I don’t think that we are going to do Metallica or Megadeth for a bedtime routine! But I would do a little Josh Groban, a little I don’t know. That is my random artist of the day. Put on a little music and then give them their night time bottle. If you have to tandem feed them, then yeah, tandem feed them because what other choice do you have. Get your bouncy seats if you are bottle feeding. Bouncy seat – bouncy seat, bottle – bottle, boom – boom, you are feeding some babies. The other thing that you could do is breastfeeding, if you are breastfeeding clearly you have that down pat. You are going to give them their bottle and then you are going to put them in. You put them into their ideal sleep conditions, put them into their crib, then you kind of just let them go, and you start either the extinction, the gradual extinction or whatever. That is what a good sleep routine is. Now – a lot of people read books. They are like, I’m going to put the babies in their crib and we are going to read “Goodnight Moon”. But, you know what’s funny? If you or your spouse has gone back to work and you have some briefs to read for work. Or if you are a teacher and you need to grade some papers. Why not use those as a little reading before bedtime. Right? What you do is you just bring those in. I always joke that you don’t have to read “Goodnight Moon” for the 800th time in a row. You could read Entertainment Weekly, Us Weekly, anything that’s going to put the babies to sleep. Because it is not the words that are putting the babies to sleep, but it is actually the rhythm of your voice. The soothing little vocalness of your voice…what is the word that I am looking for? It’s the voice, not the words. You can read anything that you have to. I remember my husband used to often read stuff from work. Even in the NICU with the twinnies, I would bring Entertainment Weekly and I would just be sitting there. Let’s get to another question. The question is from a Twiniversity student. The student was asking, “one crib or two?” This was the monumental question of the day. Where should these kids be sleeping? The American Board of Pediatrics says that your baby should be sleeping in their own bed. There should be nothing in their bed including their twin. However, right, this is always the crazy question. Can they sleep together? I say yes, they can sleep together. So, your twins are totally eligible to sleep next to each other. Your twins will actually regulate their body temperature and heartbeat off of each other. So if you are thinking one crib or two you could definitely think one. These are the three items that you need to buy new. It’s kind of mandatory. Everything else you can get second hand. I would strongly consider buying crib mattresses, car seats and cribs as the new items. Also remember, when you are buying your crib mattress, you might want to look for one where one side is softer for toddlers, but one side is firmer for babies. Think about that when you are looking to purchase your mattress. You know there are so many different mattresses out there. It is just overwhelming. There are gel mattresses, foam mattresses, and then coil mattresses. You have to do your homework and find out which one is best for you. Prize time! We are giving away the contour changing pad. If you would like to win the contour changing pad, all you have to say is “I want the contour changing pad”. Yes, that is a mouthful. But then we know which prize you want to win. Go take a look at their website too. Our friends over at Colgate are like the granddaddy of the mattresses. Which I love! They also were telling me that they have a machine in their factory. What that machine does – it has these feet that jump on mattresses. It is the equivalent of a toddler jumping on the mattresses. They invite all of their mattress competitors to join them at their factory and test their mattresses on these giant feet! If Colgate has a picture of that, it is something that I have always wanted to see. If you would like to win the contour changing pad, all you have to do is tell us that you want to win. I would like to once again say thank you to our friends at Colgate for giving us the opportunity to come on and talk about sleep and have a little chat. Answer some questions and have some fun. Wishing you a very belated – but happy – Mother’s Day. I always wish you the sweetest of dreams. Make sure you check out our friends over at Colgate and if you are in the market for a new mattress or changing pad you definitely want to check it out. Thank you so much Colgate for participating today and for answering our questions. If you do find the picture of the jumping thing I would love to see it! Thanks for all of you guys joining us today and thanks to the entire Mom Squad for making this happen. See you later alligators and sweet dreams!